What Who PowerPoint Templates And PowerPoint Themes 1012-Develop competitive advantage with our above template which contains a diagram of questions crossword. It imitates brainstorming, education, information, internet, solution, support, search and thinking. This image has been conceived to enable you to emphatically communicate your ideas in your Business PPT presentations. The structure of our templates allows you to effectively highlight the key issues concerning the growth of your business.-What Who PowerPoint Templates And PowerPoint Themes 1012-This PowerPoint template can be used for presentations relating to-"All question words crossword, business, cubes, boxes, signs, people" Dont re-invent the wheel. 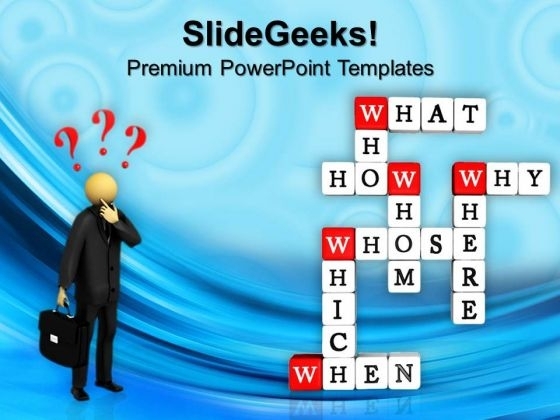 Save time with our What Who PowerPoint Templates And PowerPoint Themes 1012. Make sure your presentation gets the attention it deserves. Create the right environment for prosperity. Fashion the right conditions with our What Who PowerPoint Templates And PowerPoint Themes 1012. We present our Question Words Crosswords Business PowerPoint Templates PPT Background For Slides 1112.Use our Business PowerPoint Templates because,You have secured a name for yourself in the domestic market. Now the time is right to spread your reach to other countries Use our Cubes PowerPoint Templates because, Your brain is always churning out ideas like cogs in a wheel. Use our Boxes PowerPoint Templates because,You know that the core of any organisation is the people who work for it. Use our Shapes PowerPoint Templates because,The graphic is a symbol of growth and success. Use our Success PowerPoint Templates because,Your quest has taken you well onto the path of success.Use these PowerPoint slides for presentations relating to "All question words crossword, business, cubes, boxes, shapes, success" . The prominent colors used in the PowerPoint template are Red, White, Black Get your ideas buzzing with our Question Words Crosswords Business PowerPoint Templates Ppt Background For Slides 1112. They will be flying all around. Motivate teams with our Question Words Crosswords Business PowerPoint Templates Ppt Background For Slides 1112. Download without worries with our money back guaranteee.